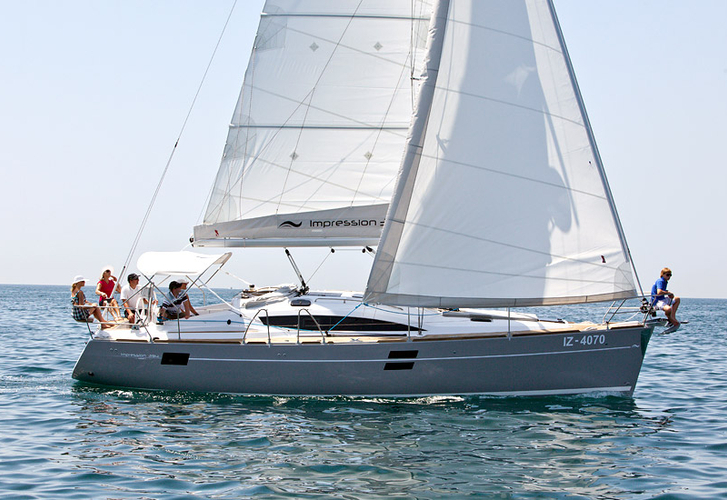 In 2014 has been built sailing boat Elan 394 Impression named Time Out. This boat is based in port Sibenik in region Sibenik in Croatia. You can accommodate up to 8 passengers on the sailing boat Time Out. Layout of sleeping places is 8 (6+2). There are 3 cabins situated below yacht's deck. Time Out has 2 toilettes with showers. You can see more vessels in this site: Yacht charter Sibenik. With 11.90 meters of lenght and 3.91 m of width Time Out provides enough space for comfortable sailing. Elan 394 Impression Time Out is equipped with: Autopilot, Plotter gps in cockpit, Bow thruster, Radio / cd player, TV, Dinghy, Anchor electric windlass, Bimini top, Teak cockpit. . Deposit accounts for 1500.00 EUR. Analyze other boats by opening this link here: Yacht charter Sibenik.